Do you want to participate in the Reparations Oral History Project? You are invited to participate in ‘Our Movement is One: African Contributions from London Between 1990 to 2016 in Charting the Historical Trajectory of the International Social Movement for African Reparations (ISMAR)’a research study into the ISMAR based in the UK. The research is being conducted by me (Esther Stanford-Xosei) as part of doctorate in history at the University of Chichester. Before you decide whether or not you wish to participate in, it is important for you to understand why the research is being done and what it will entail. Please check the info on this blog about the Oral History Project and what participation will entail. Should you have any further queries or concerns, please do not hesitate to contact me by email below. If you agree to participate, your involvement will make a valuable contribution to this project and recording of the oral history of reparations advocacy and activism based in the UK. Are you interested in being part of an African Reparations Transnational Community of Practice? What is a Community of Practice? Communities of practice and issues of identity are universal and have always they have existed for as long as human beings have learned together. However, according to popular conceptualisations, a community of practice (CoP) is, according to cognitive anthropologists Jean Lave and Etienne Wenger, a group of people who share a cause, interest, profession or vocation. In a nutshell communities of practice are groups of people who share a concern or a passion for something they do and learn how to do it better as they interact regularly. 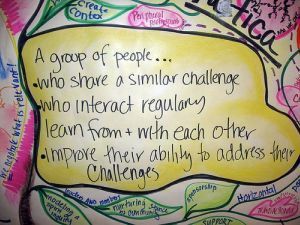 They are held together by a common interest and are driven by a desire and need to share problems, experiences, insights, tools, and best practices. Communities of Practice can exist online, such as within discussion boards and newsgroups, or in life settings, such as at work, in a community group, or elsewhere. Rather than looking to learning as the acquisition of certain forms of knowledge by individuals, Jean Lave and Etienne Wenger maintain that learning is a process of social participation which takes place through a connection of interactions and understandings with others. It is also important to remember that a CoP is a strategy or approach, it is a way of participants working together with various stakeholders to achieve common and agreed goals in a manner that can be more beneficial than each member working in silos. What are the advantages and benefits of working as part of a community of practice? • Prevent duplication of reparations organising and campaigning efforts; • Facilitate connections and collaboration among reparations advocates, activists and allies. 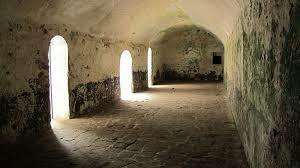 Why an African Reparations Transnational Community of Practice (ARTCoP)? As part of ensuring that my research is relevant to the ISMAR, in association with research participants, I am co-facilitating an African Reparations Transnational Community of Practice (ARTCoP). The ARTCoP is essentially an informal network for research participants and other interested stakeholders who share a an interest or passion for African reparations advocacy or activism and can be supported to share information knowledge and learning in order to strengthen or improve their reparations advocacy, campaigning or organising actions as they interact regularly. In fact, the pedagogical, understood as knowledge practices and learning processes, often takes a pivotal role in the emergence, development and sustainability of social movements and community struggles. Notably, building the ARTCoP consciously critiques the assumption that ‘knowledge’ is only generated only in academic institutions of learning such as universities. The purpose of developing the ARTCoP is to give recognition to all those involved in co-producing knowledge relevant to African reparations and then to facilitate processes for the effective use of this knowledge in the service of the International Social Movement for African Reparations (ISMAR). What are the aims of the ARTCoP ? • Support participants in the ARTCoP to develop various resources such as tools, documents, vocabulary and symbols that in some way carry the accumulated knowledge of the ISMAR. On the basis of learning being gleaned and constructive engagements from research participants thus far there is a need for the creation of a reparations movement-related education, learning and reflection space which accompanies efforts to mobilise and organise constituencies within the community of African reparations interest, builds a clear reparations social change agenda, and prepares the constituencies to choose their targets, strategies and actions to bring about the changes or improvements sought. 2. To promote honest discussions on the obstacles to integrating a reparations framework in the work of other social justice causes and movements; 3. To promote honest discussion of the obstacles to building a more inclusive ISMAR and existing reparations advocates, activists and allies working together more constructively. 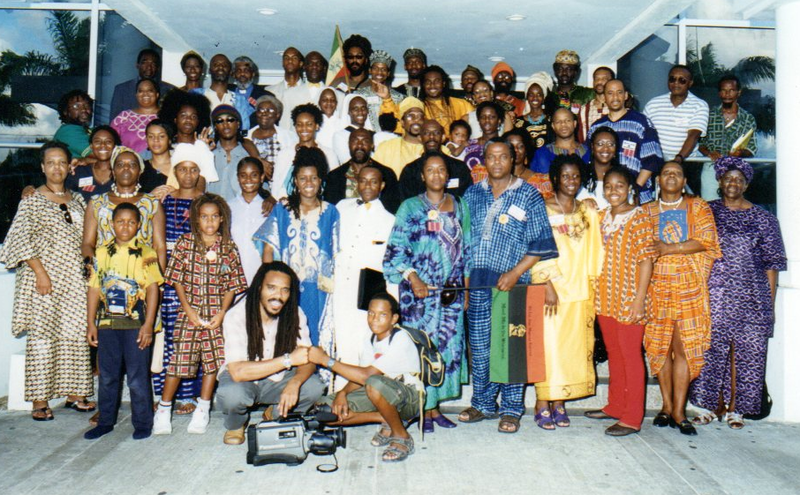 The People’s Reparations International Movement (PRIM) has been conceptualised by activists in the Pan-Afrikan Reparations Coalition in Europe (PARCOE), working through formations like the Global Justice Forum (GJF) and Momentum Black ConneXions (MBC), to refer to the collectivity of a broad alliance of social forces among peoples all over the world, consisting of a broad array of constituencies, with a range of ideological orientations, working in diverse ways, and acting with some degree of organisation and continuity to; obtain redress for historical atrocities and injustices, which have contemporary consequences; repair the harms inflicted; and to rehabilitate the victims in the process of effecting and securing the anti-systemic objectives of effecting and securing reparations. What is Social Movement Learning? Although research has been done on the importance of learning in social movements along with the importance of learning from experiences of participating in social movements, no such research exists on the experiences of activists participating in the International Social Movement for Afrikan Reparations (ISMAR). The interviews that I have been conducting, with reparations movement activists in the UK, are actually the first of its kind to probe into this issue of learning that is being done within the process of struggling to bring about Reparatory Justice for Afrikans and people of Afrikan heritage. The learning that I am referring to is the two way process of contesting, producing and acquiring knowledge as well as skills in order to take action more effectively, and learning through reflecting on the experiences of social action that follow engaging in reparations-movement building and activism. The case for these type of two way learning processes are becoming more urgent in the current economic, social, political, environmental and policy context; in addition to, the need for evaluating whether reparations campaigners are making gains and/or coming up against barriers in the movement to effect and secure holistic reparations. It goes beyond a simplistic understanding that it is enough to just be on liberation road for an x amount of years, to reflecting on what has worked and is not working, so that improvements and changes of tactics can be made towards securing the overall objectives of reparations social movement organisations and social movements which are contributing to the goals of the ISMAR. This is not to disrespect or not recognise the contributions that have been made by stalwarts in the ISMAR but to utilise tried and tested methodologies that are proven to further the attainment of the goals of movements for social, economic and global justice, such as the ISMAR. It is also important to deepen our understanding of the rich interaction of education, learning, information-sharing, teaching and action; i.e. the wealth of reparations social movement learning that builds on: the ideas of all the various freedom and liberation movements, our community’s treasure house of community knowledge, as well as the contribution of scholar-activists and organic intellectuals who have gone before us, in the pursuit of a Post-Reparations world. • When a reflective (self, organisational and group) educational dimension is incorporated into a social movement, the membership are more effectively mobilised to take action especially action which builds on, learns from the strengths as well as weaknesses of past efforts. • Such learning can be evaluated by its impact and ability to transform frameworks of thinking, knowledge and action. The ARTCoP (Afrikan Reparations Transnational Community of Practice) exists as a network to promote, advance learning and scholar activism on and for reparations. A Community of Practice is commonly understood to be a group of people who share a concern or a passion for something they do and learn how to do it better as they interact regularly. 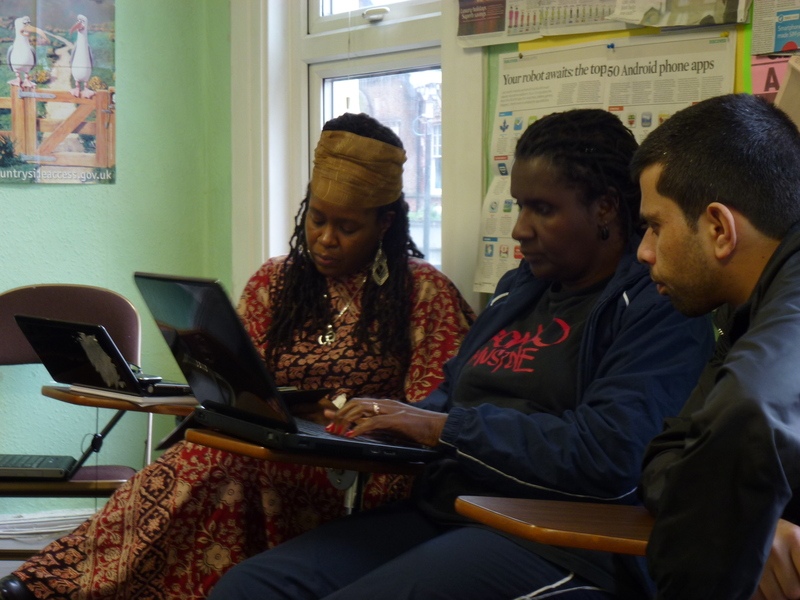 ARTCoP’s mission is to enhance grassroots community academic spaces for reparations scholar-activism. Hall B.L. & Clover D. E.(2006), ‘Social Movement Learning’, in R. Veira de Castro, A.V. Sancho, & P. Guimarães (Eds. ), Adult Education. New Routes in a New Landscape, University of Minho, Braga, Portugal, pp. 159-166. Core group of up to 20 members. The ARTCoP Terms of Reference will be reviewed by members every 2 years, these TOR were last reviewed in March 2015. Etienne Wenger, Richard McDermott, & William Snyder, Cultivating Communities of Practice: A Guide to Managing Knowledge(Boston, MA: Harvard Business School Press, 2002). Reparations action learning literacy and development is about developing the ability to get something done rather than developing the ability to talk about getting something done. It is about moving from diagnosis and analysis to experimentation, action and implementation. 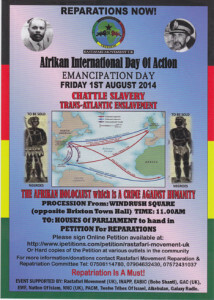 This is the link to a video from the historic 1st August Emancipation Day March spearheaded by the Rastafari Movement UK working with a whole host of other reparations and community based organisations. This is a recording from the event organised by the Royal African Society discussing ‘Reparations for Africa’s Diaspora: The Politics of Memory & Justice’ on 17 June 2014. In March 2014 leaders of the Caribbean Community (CARICOM) agreed to seek reparations from former slave owning and trading states in Europe. The heads of state from 15 Caribbean nations agreed upon a 10 point plan that will set the agenda for discussion with European nations. The issue of reparations has been discussed over a century by African Diaspora, and CARICOM’s challenge presents a forum and opportunity for progressive discussion around, international justice, the nature of reparations and the politics of memory. The panel of key figures from the African Diaspora, reparations campaigners and representatives of CARICOM states discussed the impact of reparations for Africa and the Diaspora. 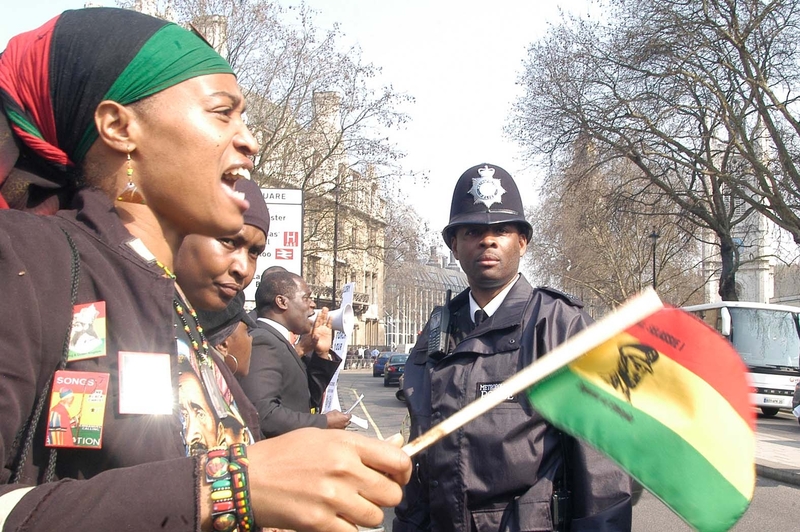 African Caribbean Reparations: Why When and How? Ths is an article from Caribbean news http://www.caribdirect.com about the panel discussion panel which took place on 24th June 2014 with Professor Sir Hilary Beckles, University of the West Indies Vice Chancellor; Harry Goulbourne, Professor of Sociology and Director of the Race & Ethnicity Research Centre, South Bank University, as well as myself when we came together to discuss the topic ‘British Reparations for Caribbean Slavery: Why When and How’.